In oceanography, a gyre (/ˈdʒaɪər/) is any large system of circulating ocean currents, particularly those involved with large wind movements. Gyres are caused by the Coriolis effect; planetary vorticity along with horizontal and vertical friction, determine the circulation patterns from the wind stress curl (torque). The term gyre can be used to refer to any type of vortex in the air or the sea, even one that is man-made, but it is most commonly used in oceanography to refer to the major ocean systems. Recently, stronger winds, especially the subtropical trade winds in the Pacific ocean have provided a mechanism for vertical heat distribution. The effects are changes in the ocean currents, increasing the subtropical overturning, which are also related to the El Niño and La Niña phenomena. Depending on natural variability, during La Niña years around 30% more heat from the upper ocean layer is transported into the deeper ocean. Several studies in recent years, found a multidecadal increase in OHC of the deep and upper ocean regions and attribute the heat uptake to anthropogenic warming. 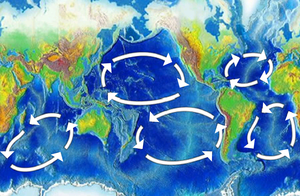 Ocean gyres are known to collect pollutants. The Great Pacific Garbage Patch in the central North Pacific Ocean is a gyre of marine debris particles and floating trash halfway between Hawaii and California, and extends over an indeterminate area of widely varying range depending on the degree of plastic concentration used to define it. An estimated 80,000 metric tons of plastic inhabit the patch, totaling 1.8 trillion pieces. 92% of the mass in the patch comes from objects larger than 0.5 centimeters. A similar patch of floating plastic debris is found in the Atlantic Ocean, called the North Atlantic garbage patch. The patch is estimated to be hundreds of kilometers across in size, with a density of over 200,000 pieces of debris per square kilometer. ^ Balmaseda, Trenberth & Källén (2013). "Distinctive climate signals in reanalysis of global ocean heat content". Geophysical Research Letters. 40 (9): 1754–1759. Bibcode:2013GeoRL..40.1754B. doi:10.1002/grl.50382. ^ Abraham; et al. (2013). "A review of global ocean temperature observations: Implications for ocean heat content estimates and climate change". Reviews of Geophysics. 51 (3): 450–483. Bibcode:2013RvGeo..51..450A. CiteSeerX 10.1.1.594.3698. doi:10.1002/rog.20022.